Hypothesis: The ingredients in the soda will have an effect on the reaction. We think the soda with the highest carbon dioxide gas content will go the highest. Material 1: The soda will shoot up approximately 12-30 inches. This will spill into a plastic basin. During several test experiments, the soda did shoot up but did not spill out of the basin. Basin will be clear in order to allow students to see reaction. 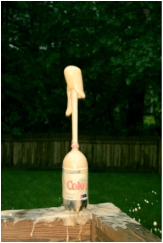 The combination of the ingredients in the soda and the Mentos causes the geyser-like reaction. Soda is made up of mostly water but also contains sweeteners, flavoring and carbon dioxide gas. Mint Mentos have many small craters (show photos and golf balls) on the surface of the candy. Once the mints are dropped into the soda, the carbon dioxide gas is attracted to the craters and forms carbon dioxide bubbles. Since there are so many craters on the Mentos, there are lots of places for the carbon dioxide bubbles to form quickly. As the Mentos sink to the bottom of the soda bottle the bubbles form and push the soda out of the bottle. Diet Soda causes a higher geyser since it contains aspartame which lowers the surface tension and causes a bigger reaction. This process is called nucleation. In conclusion our hypothesis was incorrect because it is not just carbon dioxide that creates the highest geyser. We determined through our research that there must be three key ingredients to create the highest geyser. The craters in the Mentos, the aspartame in diet soda, and the carbon dioxide gas must all be present to make this successful. Therefore, Diet Soda is the only soda in our experiment which contains aspartame creating the highest geyser. I love to play baseball, hockey,and football. I love chocolate chip cookies. When I grow up I want to be a baseball player, a football player, or a hockey player. I love to play soccer, basketball and football. My favorite food is all kinds of seafood. I love to play soccer, basketball and football. My favorite food is buffalo wings. The best place I visited was Great Wolf Lodge. When I grow up I want to be a football or basketball player.